Are you using social media marketing to promote your business online? Sometimes, it’s not just about what you’re posting, but what tool you’re using. A good social media management tool can help you get better results from your marketing, at a much faster rate. In this post, I’m going to share some of the best social media management tools on the market and help you find the perfect one for your business. Analytics: checking your analytics regularly can help you improve your social media strategy. Most social media dashboards have analytics, although they are usually not as high performing as a tool that’s dedicated to social media analytics exclusively. Still, it helps having essential information handy so that you can check it regularly and make changes to your strategy accordingly. Team management capabilities: if you have multiple members in your team that are managing your social accounts, look for a tool that has strong team management capabilities: the ability to assign tasks, leave notes, check team performance analytics and so on. Another very important consideration for businesses is, of course, the price. You can use a cost comparison tool to see how the major social media management tools stack up against each other based on their features and price. Make sure to look into what features you get for the plan you want – in some cases, you might have to pay extra for analytics reports, or for adding extra team members to your list, for example. Sprout Social is another all-in-one social media dashboard, with many features quite similar to Agorapulse. Hootsuite is arguably the most well-known and popular social media management tools, since it is one of the first to come out on the market. But is it keeping up with the needs of businesses and marketers? Mentions: I have to say, I find social inboxes much more practical to use than Hootsuite’s classic mentions stream. The issue with it is, that it makes it more difficult to tell when you’re finished going through all of your mentions. You can however take action and reply, assign, retweet, like, etc. any update. Publishing and scheduling: publishing and scheduling is very easy and the best part about Hootsuite is that it works with over 35 social networks (though this only helps if you’re using some of the lesser known channels). They also have their own URL shortener that you can use and you can view your drafts, scheduled updates, past scheduled updates and much more. 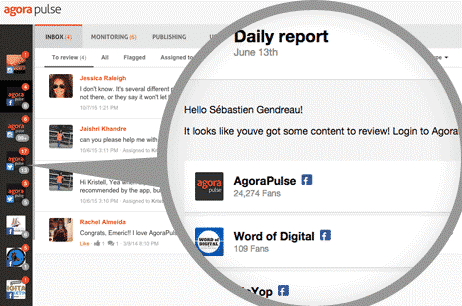 Monitoring: for monitoring, you can easily set up streams for mentions of your desired keywords. As you can see, many social media management tools have quite similar features – at the end of the day, it’s important to find the one that you’re most comfortable with in terms of the software, or if you need specific features, find a tool that has them. What do you think makes for the ideal social media management tool? Which tools are you using to manage your social media? Highly regarded on the world speaker circuit, Lilach Bullock has graced Forbes and Number 10 Downing Street with her presence! In a nutshell, she’s a hugely connected and highly influential serial entrepreneur – the embodiment of Digital Intelligence. Listed in Forbes as one of the top 20 women social media power influencers and likewise as one of the top social media power influencers, she is one of the most dynamic personalities in the social media market and was crowned the Social Influencer of Europe by Oracle. Recently listed as the number one Digital Marketing Influencer in the UK by Career Experts. She is also a recipient for a Global Women Champions Award (by the Global Connections for Women Foundation, GC4W) for her outstanding contribution and leadership in business.